There really is no greater proof of this than the funky range of Bamix mixers. Tiny, yet powerful, Bamix is perfect to perform any job you don’t feel like doing - in a whiz! From chopping vegetables to finely powdering hard cheese, making the perfect milkshake, pureeing fruit…The sky’s the limit. It’s the perfect assistant in the kitchen - and it doesn’t talk back. Bamix’s collection of hand mixers aren’t just perfect for soups and purees – they’re also an amazing accessory for your next barbecue cookout. 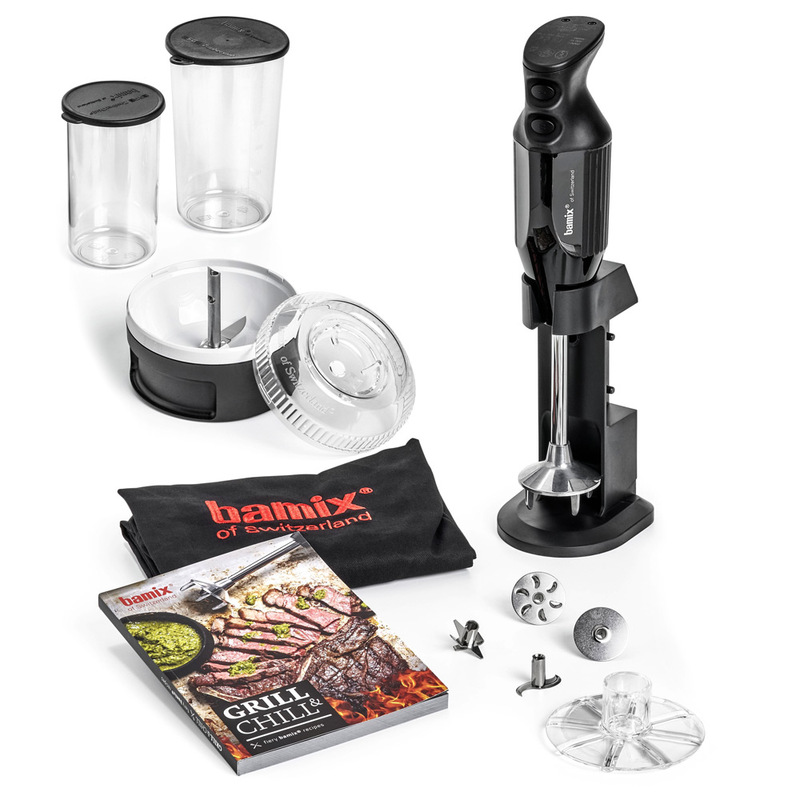 The new Grill & Chill Hand Mixer by Bamix comes with several useful attachments including a mincer for chopping meat, a beater for making marinades, a whisk for blending cocktails and a multi-purpose blade to chop, shred and more. It even comes with an apron as well as a cookbook filled with delicious recipes and amazing ideas. Crafted from stainless steel and durable materials. Designed for left-handed and right-handed use. Comes with various barbecue-related stainless steel attachments such as a multi-purpose blade, whisk, beater and meat mincer. Compact processor is perfect for creating your own garnishes, rubs and more. Includes two BPA-free jugs with lids – ideal for storing sauces and marinades, as well as serving up freshly-made cocktails. Also includes a recipe book.